These “Original Gifts of Christmas” are real. 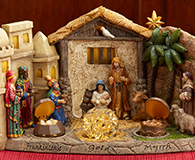 Real 23 karat gold and authentic frankincense and myrrh from the same regions as the gifts brought to the baby Jesus on that very first Christmas. 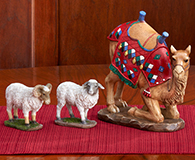 These Christmas collectibles will be at home alongside your Nativity set and are certain to become a tradition that brings years of joy. 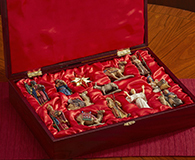 The satin lined wooden chests capture the regal spirit of the gifts given by the 3 Kings, Melchior, Balthazar and Caspar, and remind us why we give gifts on Christmas Day, the Epiphany or the Dia de los Tres Reyes Magos.